The Federal, State and Municipal government offices are all here. and cultural events. Theater presentations, dances and concerts are common. courtyard surrounded by offices on three sides. The opposition party leader walks to his seat on stage during the State of the City address. El Presidente presents his state of Álamos speech. Dr. Joaquin Navarro Quijada is the man walking across the stage. He lost a bitterly contested election in 1994 with Dr. M. Alfonso Valenzuela Salido. The Palacio was shut down for weeks by protesters. 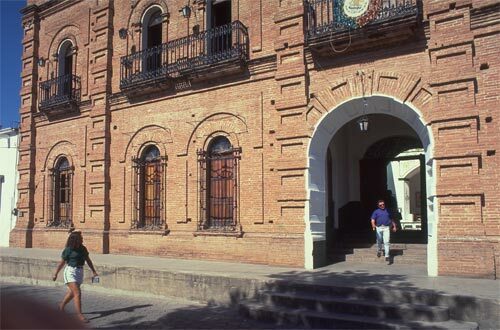 Eventually, Joaquin was given his own office in the Palacio and municipal life went on as normal. In 2009 he was elected Presidente Muncipal. Perseverance is a virtue. 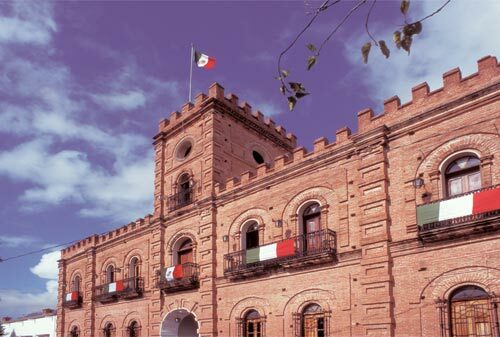 Patriotic bunting adorns the Palacio for Independence day celebrations. September 16 is Mexico’s Day of Independence. Government officials will speak from the Palacio’s balcony at night as fireworks go off around town in celebration. The long day begins with a parade through Centro Álamos that ends with a large public gathering in the Plaza. The bunting’s green symbolizes Independence, the white symbolizes religion and the red symbolizes union. 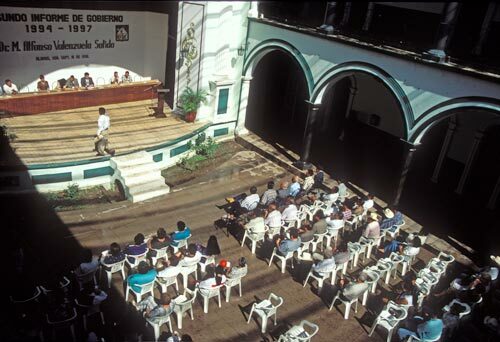 The photo above is from the closing ceremony at the Palacio. 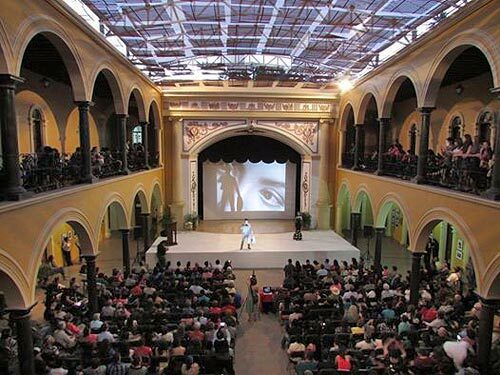 The theme of the festival was “100 years of Maria Felix” and Miguel Castillo is singing “Maria Bonita” with Maria Felix’s eyes projected onto the screen behind him. After he finished singing we played the movie “Yerba Mala” which was filmed in Alamos two years ago. There were 700 seats filled in the Palacio for the closing ceremony. Keeping the Palacio clean is a job for many. People come and go throughout the day conducting business and dealing with all issues a local government faces. 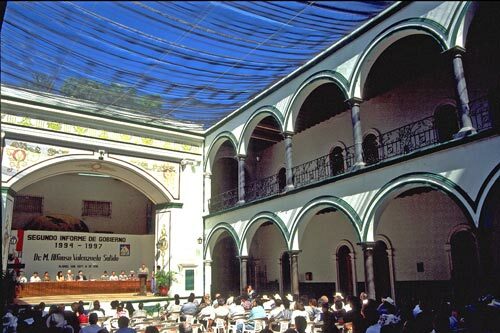 And the Palacio is a community center for events throughout the year. This is the official Álamos heartbeat that is kept alive by all people that are Álamos, Sonora, Mexico. The prime venue for the Álamos Film Festival is the Palacio. 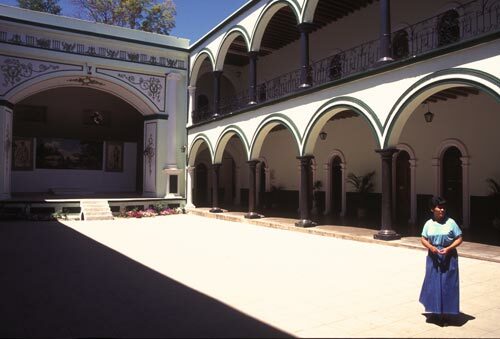 In the hearts of many, Alamos is the center of the universe. Independence day starts early in the morning with a municipal parade through the town’s colonial center. Alamos school kids, the first high school in the Californias started here, and the entire city government take part. In 2010 the students added their own uniformed marching band to the parade. From children to government, Alamos continues. Juan Batista de Anza departed Alamos in September 1775 with silver, and local families, to settle “Monterey and the Californias”, including San francisco, Santa Barbara, and Los Angeles. This page took 0.532 seconds of computer labor to produce.